We Teach You To Use The Right Muscles For The Right Movements. We believe that exercise is a continual process that relies on the consistent application of strategic methods for improving outcomes. Our entire purpose is to improve the ability of your muscular system to withstand chemical, emotional, and physical stresses. We do this by utilizing MAT® and our patented Core Restore Training System as essential tools in a process focused on increasing proper contraction of the muscular system. What Can MAT®/MATRx® Do For Me? What Can CRTS Training Do For Me? What Can Core Restore Training Apparatus Do For Health & Fitness Professionals? Chris Verdi is the owner of Core Restore, ACSM and NSCA certified Personal Trainer since 2005, an Inventor with 2 US Patents, Patent US9358413 & Patent US9700751, and is the only MATRx Certified Master Specialist in the state of New Jersey since 2007, and one of only 70 nationwide. 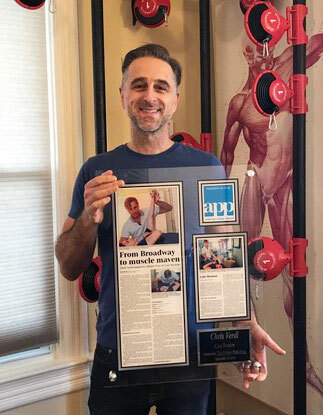 Through Chris’ unique understanding of the muscular system, he developed and patented a movement training system—termed Apparatus and Method for Muscle Movement Training. His movement training system called CRTS™ stands for Core Restore Training system. He works with everyone from athletes, to regular people with chronic muscular conditions, and/or people who are looking for a way to combat the stresses of exercise or daily living. Chris is also a distributor of Young Living essential oils. Meet the Core Restore staff and schedule a FREE service with us today! Core Restore’s Chris Verdi, the only MAT® Master Specialist in NJ, launches revolutionary movement training system!